Five on Black is a newcomer to the food scene in Missoula, Montana, opening in April of 2013. It has already become wildly popular and it isn’t hard to figure out why. $4.95 gets you a small bowl, regardless of main ingredient, that will more than fill you up. If you don’t fully believe me, opt for the gigantic large, for only $7.95. The Five on Black process is pretty simple, and broken down into five steps, on a black chalkboard (hmmmm, wonder how that happened). Step one is to choose your dish. For dishes, they offer chicken, beef, tilapia, roasted veggies and the slightly unpronounceable feijoada. What on earth is feijoada? The menu says, “It’s the national stew of Brazil! Made with bacon, sausage, beef, black beans, herbs and spices and slow cooked until it practically melts in your mouth.” Yum. Pick one of these to start. You’re going to walk around the serving section with your server, just like at Subway. Next up, pick your base. You can pick from white rice, brown rice, or crisp greens, for the low-carb folks. From there, you get to select a side. There are coconut roasted sweet potatoes with amazing depth of flavor, steamed collard greens to get your veg in, or delicious black beans for added protein and fibre. Onto step four: Choosing a sauce. If you picked feijoada, you don’t get a sauce, but don’t worry, you’ve got bacon instead. You’re doing just fine. For everyone else, pick from a delicious mango BBQ sauce or a spicy coconut sauce that is creamy and amazing. Last, but not least, top off your bowl with three of these five topping choices: chunky tomato vinaigrette, spicy chimichurri, farofa, a lime wedge or cilantro. I lost you on farofa, didn’t I? Farofa is toasted and ground manioc flour. It is sort of like breadcrumbs, but with more flavor. Give it a try. As you are walking along, picking your delicious Brazilian food, you are going to be offered a pao de queijo, or a gluten-free cheese bread bun. You want to take more than one. They are made with tapioca flour and are chock-a-block full of cheesy flavor. You might even want to take a dozen with you, they are that good. Save them for later, if you can wait that long. So how on earth did Five on Black get its start? This fellow named Tom went to Brazil back in 2011. In short, he was beyond hooked on the food, and the culture of food in Brazil. No shoving food down, with drive through speed, went on in Brazil. 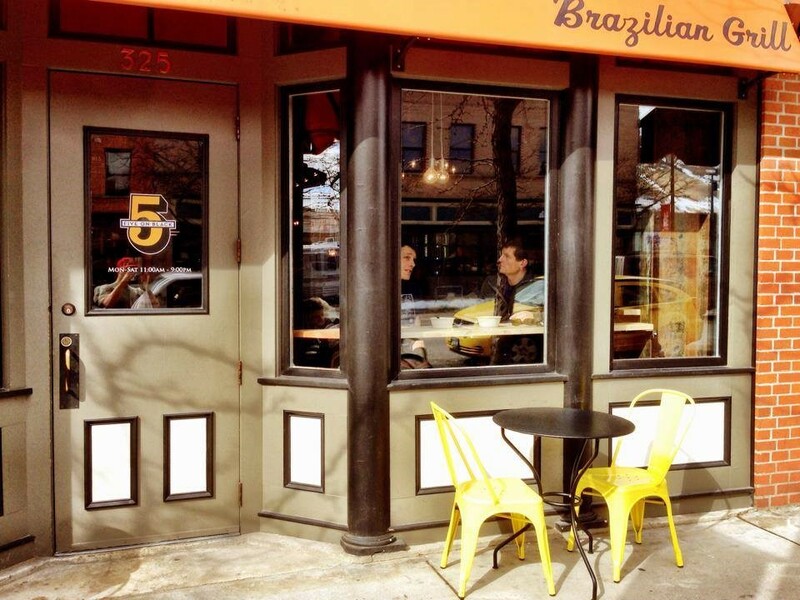 Relaxing, socializing, and letting your taste buds be enchanted is both the Brazilian way and the Five on Black way. Get to know your neighbors at their long bench tables; you’ll love it! I’ve been to some Brazilian steakhouses in Toronto, but they weren’t the same set up as Five on Black. It sounds delicious and I really like the concept! Also…yum to Brazilian food!